Last week's passive program in our teen room merged music and books in a fun, creative way. 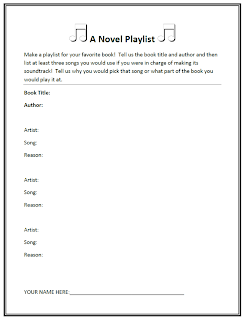 Becky, our other Teen Librarian, put together a novel playlist activity. Students were asked to pick a title of their choosing and share three songs they feel fit the story. As always, teens who participate receive a piece of candy (no shame in bribery!) and are entered into a raffle for a prize from our prize shelves at the end of the week. I love this particular activity because it asks teens to think about what they've read in a different way. What is the story about? What is the mood or tone of the story? What song best describes the way the story made you feel?